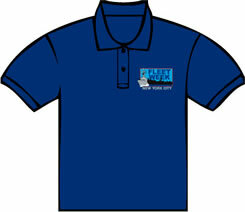 FLEET WEEK™ Apparel celebrates America and freedom, honoring our armed forces and other service institutions. 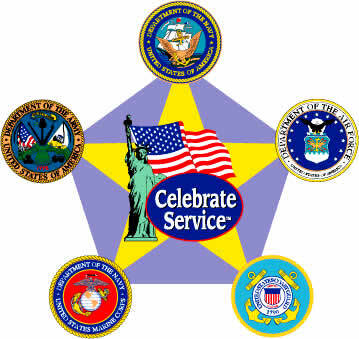 Gavin's world class images and designs continue a tradition since 1979: unique artwork in support of America's men and women in uniform and all who serve. 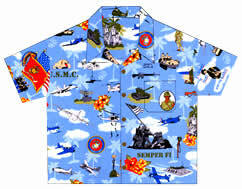 Unique and distinctive Hawaiian shirts and sarongs, saluting top jet teams and Americans in uniform. 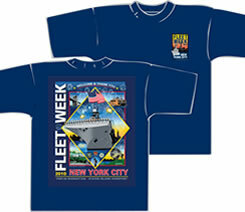 The following events are separate and distinct from and are not to be confused with FLEET WEEK™ products. The listings above do not constitute an endorsement by the Department of the Navy, the Department of Defense nor any part of the Federal Government. Celebarate Service. Click any service link to visit their site. 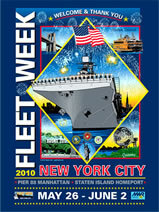 Looking for the automotive Fleet Week magazine? ©2001-2007 Paul Gavin and Kimberleigh Gavin. All rights rerserved. 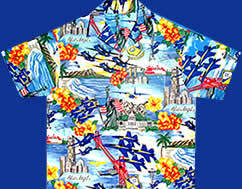 Gavin Hawaiian Designs™ and the FLEET WEEK™ Collection are a division of Gavin Fine Art & Design. These designs, as with all Gavin designs, and any merchandise produced with these designs on them, remain solely the property of Gavin Fine Art & Design. 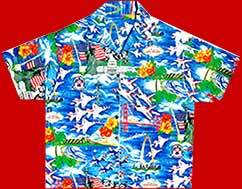 The services provided by these events, their promoters and participants are separate from and are not to be confused with FLEET WEEK™ products or any other Gavin Fine Art & Design created images and products.